Once a moving date has been arranged, it is time to prepare for the big day, and this should include making plans to leave the house clean and pristine for the new owners. Obviously, this task is more easily completed after the house has been emptied. Many people book professional cleaners, as this means one less thing to worry about on moving day. However, if this seems an unnecessary expense, you can easily do it yourself, with careful planning and preparation. It is essential to set aside any items you will need such as the vacuum cleaner, brushes and other cleaning products, ensuring they do not get packed into the van. It may be sensible to keep them in your car, only bringing them into the house once it has been cleared. When you are ready to begin, it may be helpful to adopt a systematic approach to different areas. Needless to say though, throughout the house, all floor areas should be cleaned thoroughly by mopping, vacuuming or steam cleaning, as appropriate. The Kitchen needs to be squeaky clean. Make sure oven and hobs are free from grease and grime. Rub and scrub the sink and taps. Wipe kitchen. units and drawers thoroughly, both inside and out. Get help to pull out and clean behind any kitchen appliances you are leaving, such as a washing machine, tumble drier or dishwasher. Clean out dispensing trays and wipe down outside casings. If you are leaving a freezer, clear produce and defrost well in advance. In the case of a refrigerator, remove and dispose of any food stuff. Clean thoroughly by removing trays and wiping well to remove stubborn stains. N.B. With both freezer and refrigerator, unplug appliances and leave the doors open. Clean the bath tub and polish the taps. Scrub all parts of the toilet. Wipe over towel rails and shelves. Living Areas should be free from dust and dirt. 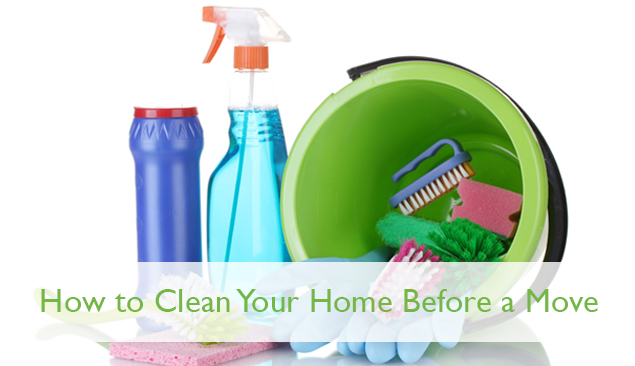 Wipe all surfaces, including skirting boards, window sills and doors. Clean out fireplaces and/or log burners. The Garage, shed and other outbuildings should be cleared and cleaned. After all items have been removed, any cobwebs should be cleared, areas should be tidied and swept. Many people regard the garden as an outside room. If possible, try to leave a neat outside area by mowing the lawn and tidying the flower beds in the days before you are due to move. Leaving a clean house will help to give closure on your old home. As you go, do remember to take any rubbish with you and just hope that you will find your new home in a pristine state.